The best I could do which chive blossoms in the past, was stick them in a vase. I am an admitted late bloomer when it comes to learning about edible flowers. This year I am at last discovering all the wonderful things you can do with them. I wish I had more chive blossoms right now. The first bloom of the chives yielded just enough blossoms to make a tiny amount of chive vinegar. I absolutely do not like the taste, smell and especially aftertaste of raw onions. Letting a chopped shallot sit in vinaigrette for a mere hint of onion flavor, and strain it afterwards is my tolerance limit for raw onions. So I thought chive vinegar would be a good way to get the onion flavor without the onions. Asparagus is one of the crops I do not grow in my garden because I can buy it super fresh from local farm stands. The asparagus was supposed to be for dinner tonight. Yet before I had even washed the dishes my husband and I had nibbled most of it for lunch before heading back to our offices. No doubt, I will have to plant more chives for the blossoms alone, so I can make more of that vinegar. The formula for the vinegar is simple: Put freshly picked untreated chive blossoms, washed and drained, in a screw-top jar. Add apple cider vinegar, enough to immerse the blossoms. Cover and let sit at moderate room temperature, away from direct sunlight, for 5 to 7 days until the blossoms are completely discolored. Shake the jar once or twice a day. Strain and discard blossoms. The Sauce Tartare is adapted from Julia Child’s Mastering the Art of French Cooking. 1. Wash the asparagus and trim the ends. 2. Bring water to a boil in a large deep skillet. Add the lemon juice and cook the asparagus uncovered at low to medium heat until it can be pierced with a kitchen knife. Drain, rinse with cold water, and drain again. Set aside. 3. For the Sauce Tartare, separate the yolks from the eggs, leaving the whites as intact as possible. Finely chop the egg whites and set aside. Mash the yolks with the mustard and the salt until no lumps remain. 4. Gradually add the olive oil and whisk thoroughly by hand until you obtain a thick smooth emulsion. Add the vinegar and whisk until fully incorporated. 5. Finely chop the capers and add them to the sauce with the chives. Season with salt and pepper. 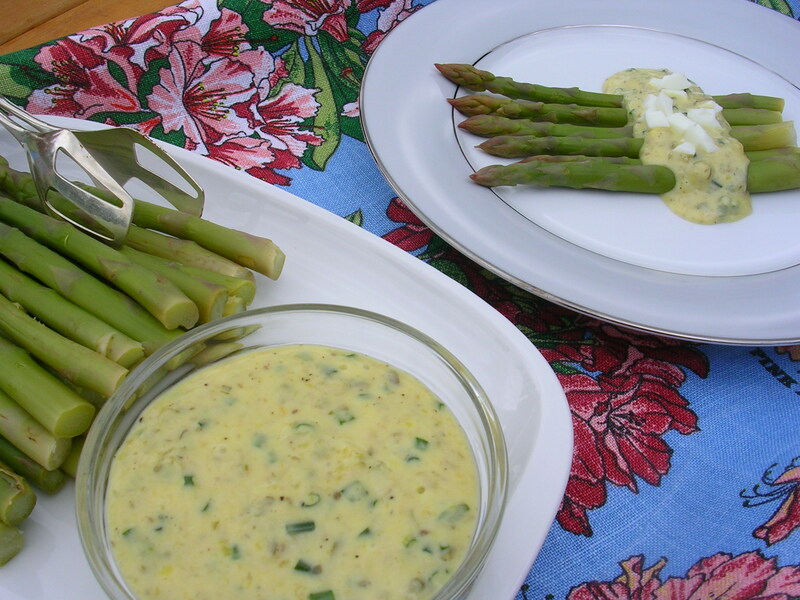 Spoon some of the sauce over the asparagus, and sprinkle with chopped egg whites.